As the warmer weather draws near, you may need to start preparing yourself for the coming boating season. You probably think of getting the boat waxed, engine checked, gear put away, but you should also be thinking about getting your seating areas ready for the season. As you can imagine, the seating areas on your boat take a beating in the summer months from the sun, water, and people on your boat. Well, here at Furniture Clinic, we want you to spend less time cleaning your leather and spend more time enjoying your time on the water! Here are some tips that will make maintaining your seating areas easier throughout the summer! Cleaning and Protecting your leather from all the elements during boating season is key to keeping your boat looking pristine. By performing some general maintenance at the beginning of the season, you will be starting the season off on the right foot. This is a key step in starting off the season right. You want to make sure your leather is clean from any dirt, dust and other types of grime that may have accumulated from storage. Our Leather Ultra Clean is a leather cleaner that has no solvents or abrasives, allowing the product to clean off any dirt, dust and grime that has settled on your leather without causing damages. After making sure your leather is clean from any dirt, dust and grime, you will want to now protect that newly cleaned leather. Our Leather Protection Cream will help feed, nourish and protect by holding general dirt or soiling on the surface to make cleaning easier. Our Leather Protection Cream also has advanced barrier technology to help repel staining to your leather. Apply both our Leather Ultra Clean and our Leather Protection Cream every 3 to 4 months or sooner to keep your leather clean and protected. We offer our Leather Care Kit which comes with our Leather Ultra Clean, our Leather Protection Cream and accessories for application for just $29.95! This is a frequent problem for leather that is exposed to the sun for extended periods of time like the leather on your boat. The rays from the sun can be harmful to your leather and overtime, can fade the color of your leather. Instead of purchasing new cushions, you can restore color back to your leather to have new looking cushions at the season's start. As per the General Maintenance section, we advise to clean your Leather with our Leather Ultra Clean before any restoration of your leather. This will make sure any dirt, dust and grime is removed from your leather so that none is left behind when you begin your restoration. To bring back the life of your faded leather, you will need to re-color and re-finish your leather. Our Leather Colorant Kit will provide you with all the necessary products to prep your leather by removing the manufacturer's finish, apply new color to your leather using our Leather Colorant and applying a new finish to your leather using our Leather Finish. Our Leather Colorant Kit comes in four sizes and you can choose from a variety of colors on our Standard Color Chart. You can even pick a new color for your leather to bring some new life to your boat! We also offer a Color Matching service where all you need to do is provide us with a sample of your leather, at least the size of a nickel, and our Color Technician will be able to match the exact color and finish of your leather. Protecting your leather with our Leather Protection Cream is a key step to keeping your newly restored leather in tip top shape. During the Summer months, your boat leather will be exposed to all various kinds of body oils, food oils, and other types of oils. 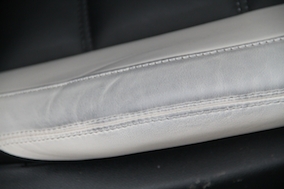 Some oily marks can leave a darkened area on your leather in areas of constant contact. By using our Leather Degreaser, you will extract grease and oil contamination from your leather. Spray the Ultra Clean onto a Terry Towel and give the grease stained area a thorough clean. If the grease stain has built up over years of use (where you rest your head or hands) you should soak the leather in the Ultra Clean and squeeze the leather through the Terry Towel. This will absorb a larger amount of grease into the towel saving the amount of Degreaser used. Our Leather Degreaser is applied over the contaminated areas using a paint brush. As the Degreaser dries, it will extract the oils from your leather and dry into powdered form. You should notice the powder of the Leather Degreaser dry into a brown/yellow color. This means that it is extracting and absorbing the oils. Once dried, you will want to vacuum the powder off and clean the area with our Leather Ultra Clean. If the oil mark is still present, repeat use of the Leather Degreaser until the powder from the Leather Degreaser dries white. That will indicate that no more of the oils can be extracted from your leather. To stop grease being absorbed again, use the Leather Protection Cream once every three months for thorough grease stain protection. During the summer, your boat can be used as a place for social gatherings such as dinners, sunset cruises and even parties. With constant guests on your boat, you never know when a drink can be spilled or dye transfer from wet clothing can stain your leather. Our Leather Stain Remover will easily remove tough stains from dye transfers to juice and food stains from your leather. As with every restoration, you will want to clean your leather with our Leather Ultra Clean. You want to thoroughly clean the stained area and may notice that our Leather Ultra Clean may be able to help remove the stain. You will apply our Leather Stain Remover to a sponge (never directly to your leather) and gently wipe the stained area. As the sponge absorbs the stain, rotate the sponge so that a clean area of the sponge is always removing the stain to prevent spreading of the removed stain. After applying the Leather Stain Remover with a sponge, we advise to wipe any excess Leather Stain Remover from your leather. If the stain persists on your leather, repeat Steps 1-3 until the stain is lifted. To help prevent future staining and to make leather easier to clean, apply Leather Protection Cream once every three months. If this is done, future stains will wipe off easily using a damp cloth or the Leather Ultra Clean. By making sure your leather is cleaned, restored and protected at the start of the summer, you'll spend less time maintaining your boat and more time enjoying your boat with friends and family!